LOS ANGELES (CelebrityAccess) — Hot on the heels of their highly successful Joshua Tree tour, Irish rockers U2 have announced a new album and plans for a new tour in 2018. 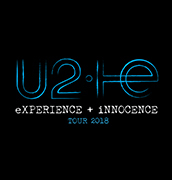 Songs of Experience, the 14th studio album from U2, will be released December 1st, 2017 by Interscope Records in the U.S. and via Universal Canada and promoter Live Nation has confirmed that U2’s eXPERIENCE + iNNOCENCE Tour will begin in North America with dates starting in May 2018. The tour will kick off on Wednesday, May 2nd, 2018 in Tulsa at the BOK Center and run through the end of June when the band performs a pair of shows in the New York region — Madison Square Garden on June 25th and the Prudential Center in Newark on June 29th. U2 will be using Ticketmaster's 'Verified Fan' system for ticket sales with tickets going on sale on Nov. 20th. Three singles have already been released from the new album, which the band touts as a 'companion' to 2014’s "Songs of Innocence." Produced by Jacknife Lee and Ryan Tedder, with Steve Lillywhite, Andy Barlow and Jolyon Thomas, the album features a cover image by Anton Corbijn of band-members’ teenage children Eli Hewson and Sian Evans. Several tracks from are available across digital platforms to tease the new album, including the previously unreleased, "Get Out of Your Own Way”; the first single "You’re The Best Thing About Me" which was released on September 6th; and the album version of “The Blackout,” which was previously released as a performance video in August. All three songs are available now to stream across all platforms.